Cleopatra was said to have used red gold in her bathwater. Alexander the Great was said to bathe his battle wounds in red gold. In the 14th century, red gold was even used to fight the bubonic plague. Red gold is also known as saffron. Did you know that saffron is a spice and that it is the most expensive and sought after spice in the world? Saffron is also red. That is why it is called red gold. It is extracted from the saffron crocus flowers. The flowers are purple. The beautiful purple flower must be harvested in the morning by hand. The flowers blossom at dawn. As the day passes, the flowers will wilt and become useless. There is a folk song which goes like this, “The saffron rose is a fragrant flower that grows in the sunlight and dies at sunset“. Each flower has three tiny threadlike stigmas in the centre. Only the upper red pistils are of value. Once it is harvested, it is dried and then lightly toasted. This must done over very low heat and watched over very closely as it burns very easily. If burnt, it would cause a loss of thousands of dollars. Saffron is expensive because it is an extremely labour-intensive crop. It takes roughly about 70,000 crocus blossoms or 210,000 stigmas to produce just a pound of saffron spice. And 40 hours of labour are needed to pick 150,000 flowers! The total production of saffron in the whole world is roughly about 20,000 kilograms per year only. The price can go up to US$11,000 per kilogram! It is mainly grown and produced in countries such as Iran, India, Spain and the Netherlands. In fact, 80% of saffron comes from Iran. Even though this spice is so expensive, it is very widely used as it is very powerful and only a bit is needed. 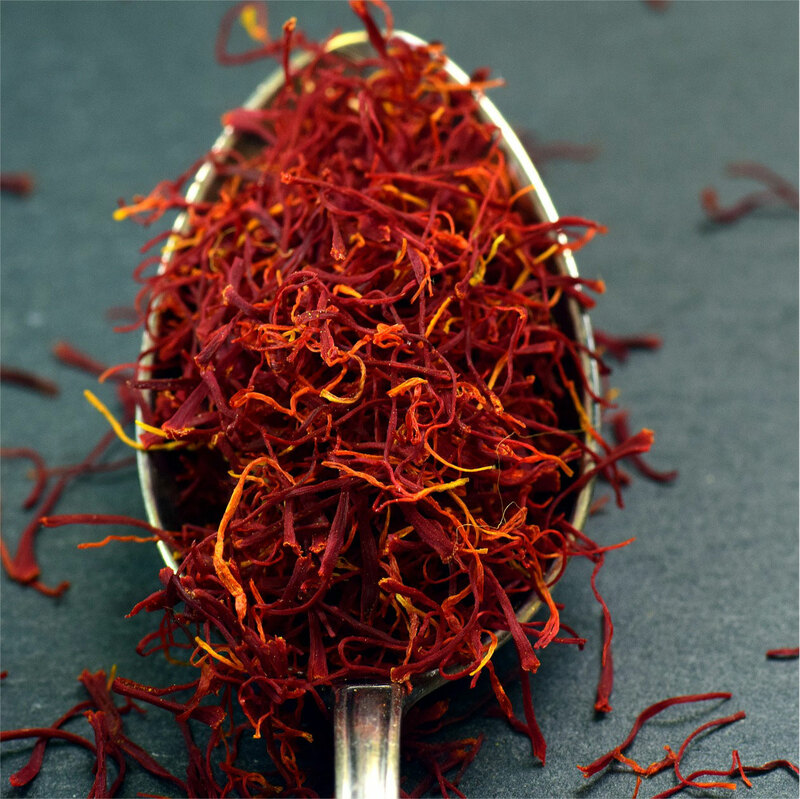 Saffron gives a rich and warm taste to food. It tastes something like honey and yet is slightly bitter. It gives out a very strong aroma. The food which uses saffron will be yellow-orange in colour.